Every now and then, an Ipoh eatery will surface from seemingly out of nowhere and tantalize this Motormouth’s palate so much; the establishment usually leaves a lingering impression months or even years after the first dining experience. Restaurants in this category are rarely new kids on the block, or (God forbids); chain outlets. More often than not, these esteemed maestros are well-established restaurants championed by a chef (or group of chefs) who have been in the business for so long, they literally make your eyes water from the realization of their invested labour and passion. After spending more than two decades of my life in Ipoh, I am quite ashamed to say that I have not visited or even heard of classics like this Teo Chiew Restaurant situated off Maxwell Road near to Merdeka Garden. 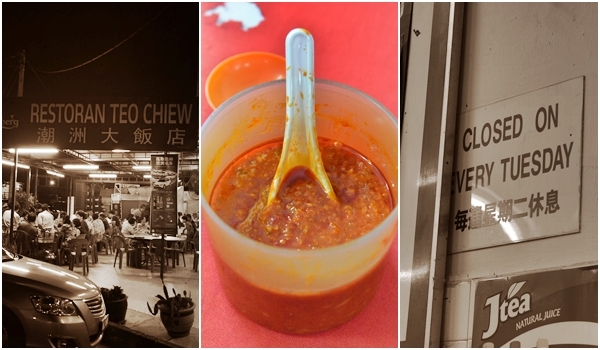 Remember this post on Wan Chai Kok’s Claypot Indonesian Prawns? Teo Chiew Restaurant is located just across the street; and this pair of ‘dai chow’ restaurants bring forth a sense of vibrancy and camaraderie to the otherwise very serene neighbourhood come nightfall. A glance around the restaurant during dinner hours revealed that most patrons came for the Teochew steamboat; seated at the outer portion of the restaurant. Raucous gangs of tens and more gathered over steaming hot pots placed in the centre of the tables; boiling cauldrons of superior broth boiled with the finest and freshest of ingredients hand-picked by the owner on a daily basis. We were seated indoors since we intended to have a wholesome feast of Teochew dishes with rice more than anything. The lady attending to us was relatively accommodating and very reassuring in her recommended choices of signature dishes; never for once letting down her guard and threw us some random ‘Sweet and Sour Pork’ or ‘Kung Pou Chicken’ like some other restaurants when this pesky blogger kept pondering over their signature dishes. Total of five dishes were ordered, though she was apprehensive when I kept insisting on the fifth. She must have not expected this entourage of two elderly ladies and seemingly average family to actually wallop a big feast! On with the FOOD please. Starting off with the beautifully steamed hollowed pumpkin filled with a savoury, braised spare ribs and soft peanuts and dried shrimps. The presentation alone was well worth some brownie points, as evident from the first shot in this series. 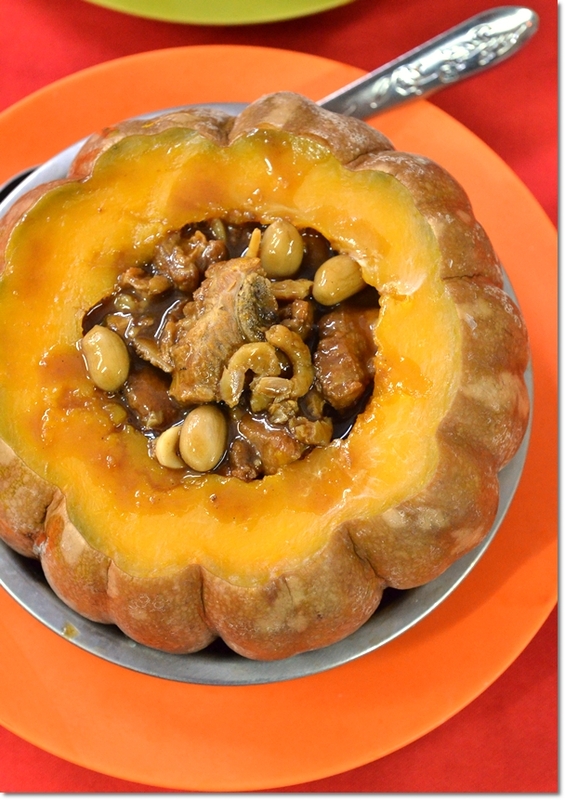 The sweet flesh of the pumpkin was steamed to a soft yet not mushy texture, while the fillings of spare ribs with peanuts and dried shrimps was a delight to be relished with white rice. Most of the other tables of diners opted a serving of this, thus clearly this falls into the MUST-ORDER category. The “Kai Lan Pou” was unlike any other dish you would have imagined. 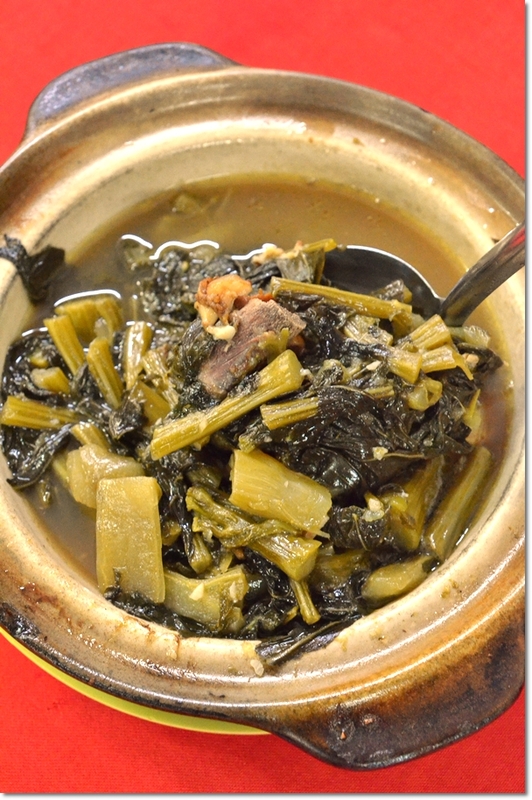 Appearing like a cross between “Kai Choy” (spicy and sour boiled mustard greens with dried chillies and pork) and a hearty soup with boiled greens, the broth was a sweet-and-savoury one. Not spicy in any way, this was most suitable for the grandparents and well, the old-at-heart (like yours truly). As generic as this could sound, the Teochew steamed fish with preserved plum, ‘ham choy’, tomatoes and soft, wobbly beancurd came next. However, the recommended fish was not the usual pomfret but instead a ‘chicken’ fish. Apparently, ‘chicken’ fish comes from the sea and the awkward name comes from their Malay name of ‘Ayam Laut’. This ‘Chicken’ fish is actually a species of the leatherjacket fish. The differentiating features? The bigger bones and flesh that is firmer and not as flaky like the other species. Steamed in a sauce that was neither too sour nor salty, the fish was a delight to devour since the bones came in minimal quantity, plus studded with chunks of flesh that came off like well…. chicken meat. The other dish we ordered were Golden Tofu Cubes with a signature sauce that they took immense pride on. 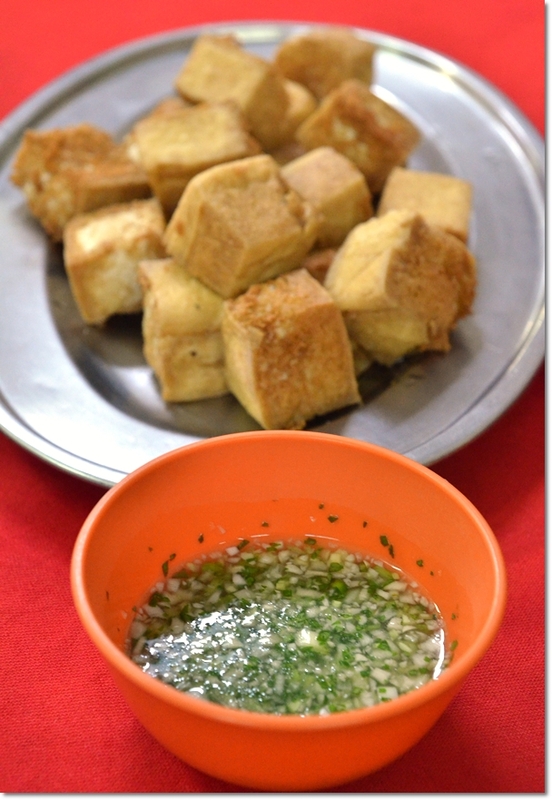 Deep-fried cubes of velvety soft and supple beancurd, dipped into the slightly briny sauce made up of finely-chopped coriander, scallions and garlic, laden with what could possibly be fish sauce (?). If this is not to your fancy, go for their incredibly addictive special blend of chili sauce as pictured below. The final addition to the plethora of Teochew dishes was a very unorthodox platter of chilled braised pig’s ears served with pickled papaya. 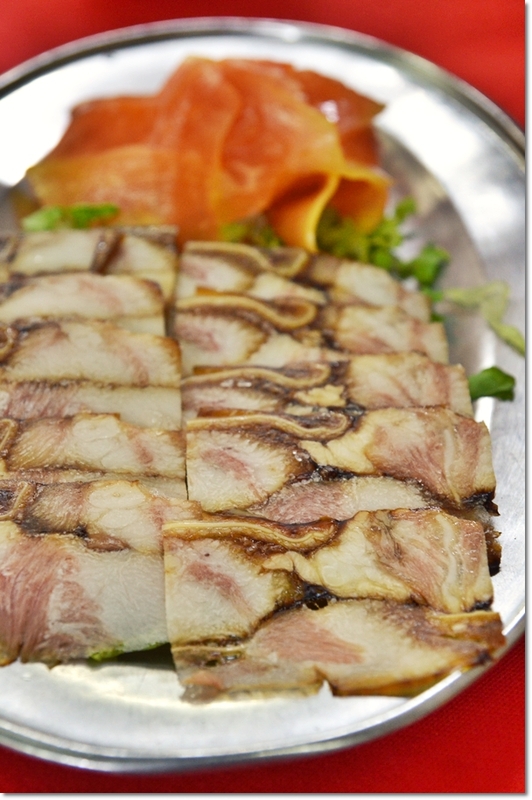 This could be a wonderful snack to go along with chilled beer, or to tamper the ‘flames’ from the hot pot. The meal came to RM92/USD30 for the 5 of us. Pretty reasonable given the quality of the dishes served and the scarcity of some of those. The service was very pleasant too, with the owner himself walking over and starting up a lengthy conversation, and even the ladies serving us were rather courteous. An astounding 19 years into business, the owner claimed that the head chef of the restaurant is none other than his wife, whom hailed from Chaozhou herself. There are a total of only 4 pax running the kitchen, hence they are constantly suffering from a short on staff situation. That’s the reason why they could not whip up other signature Teochew dishes that require more laborious effort; like “Orh-Ni” or yam paste pureed and laced with lard oil and boiled ginkgo nuts. They do serve braised duck on a daily basis, but braised pork and eggs (Teochew’s very well known for their braised dishes) are only served periodically. But the most sentimental portion during the exchange of words was that ….. he does not see the business surviving past their times. Don’t get me wrong, the business has been great all along. But since their children are not willing to continue this legacy of a Teochew cuisine stalwart in Ipoh, the art of authentic Teochew cooking may succumb to modernization. *For the steamboat, if you intend to try their special soup base like beef steamboat (minimum 10 pax) or herbal stock, please call and reserve a day in advance. the pumkin dish really attract me..
Really This ‘Chicken’ fish is actually a species of the leatherjacket fish. Oh great. So the guess was not too far off then. Thanks. The food all looks fantastic, but I really want to try that chicken fish! Regarding the “Chicken fish”, I still recall there was a news about few peoples having food poisoning while 1 death after they consumed the so called “Chicken Fish”. Host can refer to the GuangMing daily link as attached: http://www.guangming.com.my/node/27964. I am wondering whether the picture shown in the link above is the same kind of fish they served for the customer. Drove all the way from KL last weekend & got lost in getting to the restaurant. Luckily managed to called the owner who speaks pretty good English has given us the detailed direction! Your recommendation on the spare ribs pumpkin was spot on! One must mixed the spare bibs together with the soft pumpkin to savour its unique taste. Their speciality tofu was amazing when it goes together with their special sauce. Each guest was given their own bowl of sauce. 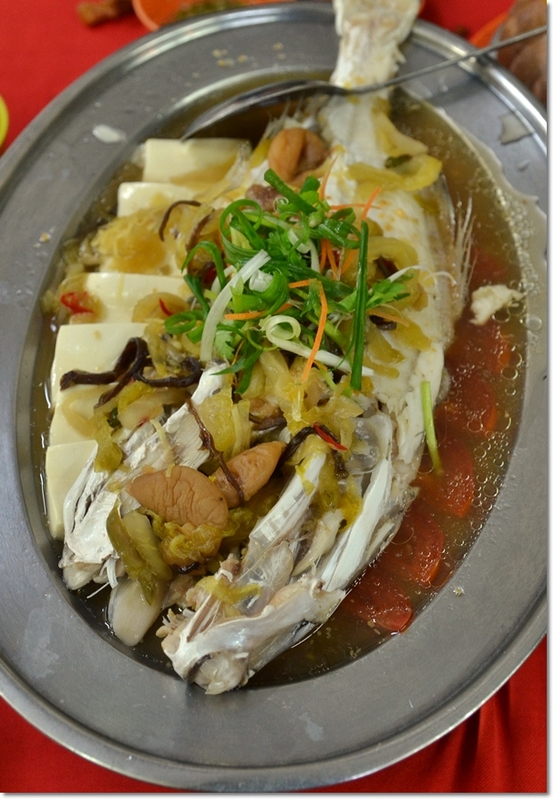 We had steamed stingray ala TeoChew style, something different from the usual fish used. Claypot TroChew Vege was order…so so. At the last dish was fried crabs with butter milk…crabs was fresh & meaty, goes well with the sauce. End of the day, worth all the trouble looking for this restaurant. Cheers! A satisfied customer no less! Yeah, indeed one of the rare gems that’s still pretty much undiscovered, save for the locals and some lucky outsiders. Fried crabs with butter milk. Oh dear, I can spot a craving building up really fast! I just love your review! I wonder if this restaurant is the one called White House restaurant (coffeeshop style on a corner roadside), or do you know of that restaurant? I am looking for a picture of it if it is still there, if possible showing the name over it. It is near Lim Gardens.